This promotional copy limited to 300 editions on clear vinyl with a chrome [referencing the Chrome Nun album to be released in 1973] coloured gatefold that includes a booklet containing eight pages of lyrics and colour photographs that would later be issued in black & white, and then eliminated altogether, was later issued on standard black vinyl and flexidisc, has a far superior musical presentation due to the mix and pressing, where the vocals and instrumentation are bright and clear, and for that reason, should ‘not’ be considered for the the collectors alone, but for anyone wishing a copy with dynamic range. If you find a copy of this clear edition, the sound quality will reach that of the compact disc version, and is better than even the cassette or 8-Track editions, though a flawless copy of the reel to reel tape will also deliver [though who has a reel to reel machine these days, and finding an official RCA issue is nearly impossible.]. It’s worth noting that there is are two drumsticks with a circle on side two of the runout groove. Copies when they are available trade somewhere between $70 and $125 when they can be found. If you’re considering purchasing one of these gems, I highly recommend that you listen to it prior to purchasing, as a visual inspection is nearly impossible with clear vinyl. The vinyl is so clear that it is possible to read anything laid under it. During the transitional period of the early 1970s, when the Jefferson Airplane was in the process of disbanding, singer and guitarist Paul Kantner recorded Blows Against the Empire. This was a concept album featuring an ad hoc group of musicians and credited on the LP as "Jefferson Starship", marking the first use of that name. 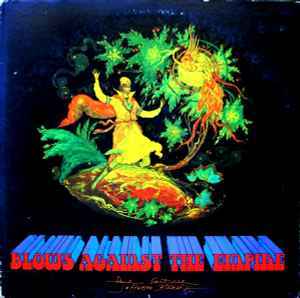 Blows Against The Empire was a concept adventure laced with great harmonies, sonic layerings, and electronic effects. This was a concept envisioned by Paul Kanter, where the youth of America rise up in a acid [LSD] induced communal effort and hijack a starship during a counter culture revolution against the oppressive ‘Uncle Samuel.’ All and all, the release is much about stepping off of the grid, stepping out from under government control, refusing a Social Security number, draft registration, and in many ways should be seen as a reference to the horrors going on during the War in Vietnam … and directly lead to those who moved to the country, including Mendocino County, where they lived deep in the woods, growing some of the world’s best marijuana, mushrooms, and continuing with clandestine laboratories manufacturing LSD and other hallucinatory substances. This 'prototype' version of Jefferson Starship included David Crosby, Graham Nash, along with Grateful Dead members Jerry Garcia, Bill Kreutzmann, and Mickey Hart, as well as some of the remaining members of Jefferson Airplane, lead singer Grace Slick, drummer Joey Covington and bassist Jack Casady. This agglomeration was informally known as the Planet Earth Rock and Roll Orchestra, a moniker later used on a Kantner album in the early 1980s. On October 14th 2008 Sony Legacy reissued this album as an import on clear 180 vinyl as an audiophile edition that was accompanied by a CD with bonus material. *** The Fun Facts: Kantner's notes that the underlying premise of the narrative was derived in part from the works of science fiction author Robert A. Heinlein, particularly the novel Methuselah's Children. Kantner went so far as to write to Heinlein to obtain permission to use his ideas. Heinlein wrote back that over the years, many people had used his ideas, but Paul was the first one to ask for permission, which he granted. Blows Against the Empire was the first rock album to ever be nominated for a Hugo Award, where in 1971 it was nominated in the category of Best Dramatic Presentation. The cover featured a piece of Russian folk art from a painted lacquer box, attributed to CCCP (U.S.S.R. in Russian). Kantner has said he enjoyed stealing the art from Russia because many of their albums were bootlegged on the Russian black market. The back cover depicts a partially opened parcel revealing a room inside with Jerry Garcia peeking out, behind him is a heavy naked woman standing on an American Flag the parcel being flown on a string by a trio of breasts with wings. Inside the gatefold is more artwork with track listings and credits, done in silver ink on black background and featuring a Paul Kantner caricature with a head of marijuana-leaf hair rising over a mountainous planetscape and inkblot pair of marijuana leaves in the lower fold. A mushroom on the left hemi-sphere pyramid on the right and the mountainous planetscape is nearly a mirror image. The inner dust jacket was decorated with collages of musician photos, writings and doodles. Original pressings included a full-color booklet as well, with lyrics, poetry and drawings mostly done by Slick during the recording sessions and collected daily by Kantner. Subsequent pressings included a black & white version of the booklet. I have played Have You seen the Stars Tonite to friends of mine who were Crosby, Airplane Byrds &/or Dead heads who somehow missed this album and are totally blown away by the tune. Beautiful space of calm and awe of spinning free in a vast universe completely free. I was spoiled by this album thinking artists make this kind of music all the time. Recorded at Wally Heiders at the same time as American Beauty, If I Could only Remember My Name & Garcia with the same musicians. Incredible time to be alive. nothing will ever come close. however,i recently bought a remastered version of After Bathing at Baxters. best thing they ever recorded as the Airplane. This is a lost classic. Featuring an all star cast of West Coast musicians such as Paul Kantner, Grace Slick, Joey Covington, Jack Cassady, Jerry Garcia, Bill Kreutzmann, Phil Lesh, Mickey Hart, David Crosby, Graham Nash - this album personifies the Haight Ashbury spirit of the 60's. A concept album detailing the hijacking of a Starship to travel into space to set up a new society on a new planet. Musically it is superb. The opening rebellious rock n roll of Mau Mau. The psycedelic banjo plucking of the Baby Tree. The soaring vocals of Grace Slick on Lets Go Together. The finest moment of all comes in the shape of the beautiful Have You Seen The Stars Tonite (would you like to come up on A deck and look at them with me)Sheer brilliance. They don't make albums like this anymore! !